Amazon Web Services (AWS) is a subsidiary of Amazon.com the largest online retailer in the US. Amazon Web Services is a remote computing service providing on-demand cloud computing platforms to companies, individuals and governments on a subscription basis. It is a technology that allows the subscribers to have a full-fledged virtual cluster of computing power at their disposal. AWS is one of the largest cloud computing services and is so present in the world being ten times the size of its nearest competitor. It also hosts popular websites like Instagram and Netflix Inc.
For security purposes, the web service is divided into 12 global regions. This allows the users to set geographical limits on their services, if they opt to do so and also to provide security by diversifying the physical locations the data is held. AWS has some of the best security systems. This is certified by the number of well-recognized certifications they have including SAS 70 Type II, ISO 27001, HIPAA, PCI DSS Level 1, and FISMA Moderate among others. Their data centers and services have multiple layers of physical and operational security. The company also conducts regular security audits to ensure infrastructural security. They also provide documentation on how to deploy security features as well as providing end to end privacy and end to end security as well. AWS provides low and pay as you go pricing with no long term commitment or upfront expenses. With Amazon Web Services, you consume as much storage or computing power as you need. This means you don’t have to overspend on hardware and storage capacity. In technology, ensuring high-availability during seasonal and periodic peaks requires an over investment in infrastructure to ensure the capacity can meet the demand. Excess capacity will cause overspending and waste while the opposite doesn’t meet demand and could lead to lagging issues and incapability. 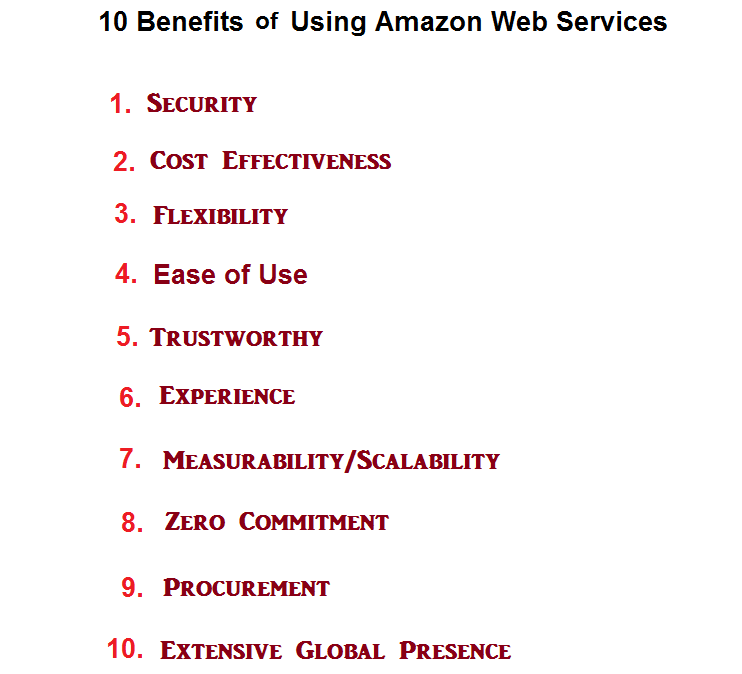 Amazon Web Services is an agnostic platform for languages and operating systems. You choose the development platform or programming model that is most beneficial to your business. This means you can choose the operating systems, programming languages and database systems that you are familiar with. This way, your IT personnel won’t need to pick up new skills now and then and this helps improve productivity. AWS was built with the motivation to create a platform where vendors, application providers and ISVs could easily and quickly host their apps. Currently, AWS completely fulfills this task for both the new SaaS-based apps as well as the existent ones. The Amazon Web Services Management Console will allow you to access the AWS’s app-hosting platform easily. With AWS, you can also use any technology you think is best for your organization. They have different operating systems, programming languages that are there for the users to choose the one that best suits them. When hosting apps and web services, companies need to ensure that their products and services are secure. This means they have to trust the web hosting company’s capabilities and also make sure they can handle the task and AWS provides exactly that. It was built over the decades and comes with excellent global computing infrastructure. Their consistent increase of their clientele which passed over $7.3 billion in 2015 is also another indication of their trustworthiness. AWS has been delivering significant scale global infrastructure for more than 15 years and this is an experience you can leverage the company on. AWS also continues to innovate its infrastructure management capabilities and skills. With AWS you can quickly add and subtract resources to any application to meet the customer’s demands and manage the costs. You also avoid provisioning resources for projects with short lifetimes or variable consumption rates. With AWS, all server backed services are charged on an hourly basis. Every service is offered with zero commitment whether you need a server to host a small website, a reliable and scalable email service or a Content Delivery Network. Procuring a new server takes time mostly from hours to several days depending on whether your infrastructure is co-located, on-premise or if you are associated with a hosting provider. You also take time to secure software licenses as well. With AWS, you can have new servers within minutes and there is no need to buy separate licenses for different operating systems and software. Amazon has global presence in 10 regions, 36 availability zones and more than 50 edge locations. Gartner positioned AWS in Leaders Quadrant of the new Magic Quadrant for Cloud Computing as a Service.